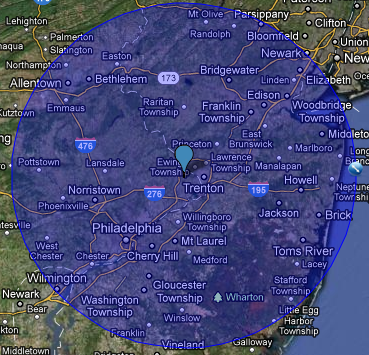 All Pools and Spas Inc. Is a Family Owned Business, Satisfying Pool Owners in Pennsylvania and New Jersey since 1967. Our Company is a long standing member of the Association of Pool and Spa Professionals (APSP) where we hold many Training Certifications. “Let our experience work for you”. When it comes time to replace your Swimming Pool Liner, Some of you out there are uncertain of which style of Pool Liner you have. Since there are many different types of Liner Replacement Applications, sometimes it can get a little confusing. To help clear up any uncertainty, we have put together a brief description of each type of Swimming Pool Liner and how it attaches to your Swimming Pool Type. This information is sure to be of some help. 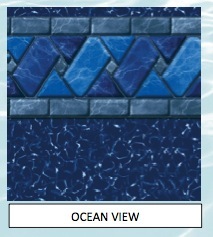 Overlap Liners: This type of Swimming Pool Liner Simply goes up and over the edge of the Pool Wall and hangs down on the outside of the Pool Wall. This type of Liner is held in place by Plastic Coping Strips. There are two types of plastic strips. The first is a flat ribbon style and the second is a more round tube shaped. These coping strips should be replaced if they show signs of being cracked or broken. 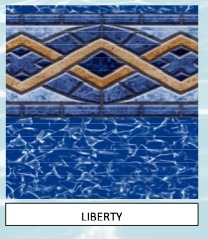 An Overlap Liner can be used in any Swimming Pool as an economical substitute for a more expensive Beaded or Uni-Beaded Type Liner. You may however, have to purchase enough coping strips for your size pool. It has been our experience that a Blue Wall with a Speckled Print Bottom is the Best Choice for the Overlap type liner pattern since that type of Pattern will allow the Swimmer to perceive the waters depth much better. The Designer Print Bottom will also help disguise any visible dirt that may accumulate on the bottom. Pools with Wood or Composite Decks may make Normal Installation more difficult. Beaded Liners: Beaded Pool Liners go up the Pool Wall then Snap into a Track using the Welt or Bead that runs along the liners entire top edge. The Track that the liner snaps into is referred as the “Bead Receiver” and it is located attached to the top of the pool wall. Sometimes the Track is built into the top of the Pools Seat Ledge which is usually a “Baby Blue” in color. Beaded Liners are more decorated usually displaying a printed tiled pattern on top with a speckled side wall and or floor. Beaded liners come in 48″/ 50″/ 52″ /54″ wall heights. When measuring for this type of liner it is Important to measure from the “Actual” Outside Wall base to the “actual” top of the wall. You may have to dig out an area on the outside in order to get an accurate measurement. A beaded liner could be used in an overlap type pool by installing Bead Receiver Track to the Top of the Pool Wall in order to accept the new Liners Bead. 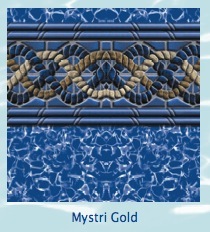 Uni-Bead Liners: The Uni-Bead or “J Hook” Liner is a very unique Swimming Pool Liner. 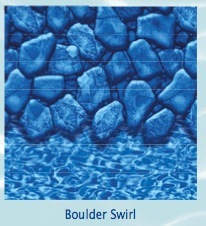 This type of liner will fit any common Above Ground Pool. The Uni-Bead Liner can clip over the wall like an overlap but in an upside down J fashion or it can be used as a beaded liner and snap directly into the bead receiver. 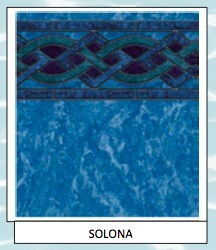 Uni Bead Liners come in Tile Top Patterns with Speckled Walls and or Floors. Expandable Liners: These are Liners that are used when your pool has a Deep End or Center Deep “Hopper”. All Hopper type liners must be installed by a professional and are subject to wrinkles or folds. Wilks Pools or Doughboy Pools are just a few that use Expandable Liners. Unlike Typical Retail Pool Stores or Internet “After Market” Liner Catalog Companies, Our Above Ground Liners are Manufactured for Pool Owner Longevity and are backed with a 15 year Manufacturers Warrantee. We offer an optional Labor insurance as well so that you are 100 % Covered. All Pools and Spas Offers Many Practical Upgrade Options. Did you know that we can add Under Water Colorful Led Pool Lighting to your Above Ground Pool? Or, maybe you would like to be massaged by a Jet Air Jacuzzi fitting that we can be easily installed. 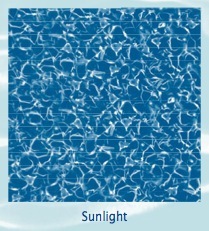 We Offer Our Protecto Wall Padding Insulation that will help increase the waters temperature by a soothing 20 degrees. 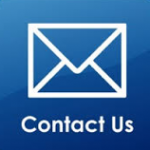 Whether it’s a Filter/Pump upgrade or Automatic Chlorination add on we offer Package discounts that you can take advantage of if purchased at the time of the Liner Installation.